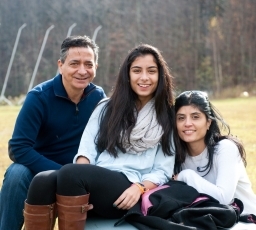 Cara Vazquez ’17, with parents Silvio and Monica, enjoyed Fall Family Weekend fun at the Snow Bowl. A great show of Panther pride after the men's soccer team's 3-1 victory over Wesleyan on Saturday. MIDDLEBURY, Vt. ­– More than a thousand Middlebury College parents and family members experienced a generous sample of life at Middlebury, from academic classes and arts performances to high-powered lectures and visits to the Snow Bowl, during the 2014 Fall Family Weekend, Oct. 24–26. The annual event conducted by the Office of Alumni and Parent Programs featured a jam-packed schedule of activities while orange leaves still clung to the sugar maples. The sun broke through the clouds on Saturday afternoon, reminding everyone that there’s nothing quite like a sunny October day in Vermont. President Ronald D. Liebowitz met with a large gathering of parents in Wilson Hall on Saturday and touched on a wide range of topics, from the new field house, due to open in January, to academic programs of interest, study abroad, campus social life, and the pending presidential transition. The final question of the morning was telling, and it came from parent Frances Marshall, of Rockville, Md., who asked Liebowitz what he would miss the most about his job. That energy was evident starting on Friday when parents and family members sat in on more than 90 classes, providing all with a taste of the Middlebury College academic experience. At the Mahaney Center for the Arts (MCFA), Professor of Theatre Cheryl Faraone conducted an open rehearsal for a scene from the upcoming production of Snoo Wilson’s Vampire. Evann Normandin ’14.5, Chelsea Melone ’15, and Leah Sarbib ’15.5 worked and re-worked the scene as parents looked on from all sides. Middlebury’s Center for Careers and Internships presented two career-networking events as well as an open house. On Friday afternoon a panel discussion on “Careers in the Common Good” gave students the opportunity to meet with parents who work to advance humanitarian causes through public, nonprofit, business, and environmental sectors. A similar career-networking event on Saturday morning, titled “Careers in Finance for Liberal Arts Graduates,” brought students and parents together with veteran finance professionals for advice on entering the profession. Friday evening, the Mahaney Center Concert Hall was packed for a sold-out performance of the live storytelling event, Cocoon, inspired by the popular public radio program, The Moth. Jay Allison, the noted Moth producer and NPR contributor, was the guest emcee for this year’s Cocoon, which featured six stories told by faculty, staff, students, and alumni. Historian David Blight from Yale University delivered the Charles S. Grant Memorial Lecture on Friday night on the topic “My Pen, My Voice, My Vote: The Life and Work of Frederick Douglass.” Friday also included presentations given by students who had received grants last summer from the Center for Social Entrepreneurship and Davis Projects for Peace; a gallery talk on emerging adulthood; a MiddCORE workshop in “design thinking”; marathon readings of Virgil’s The Aeneid on the Davis Family Library steps; and open tours of the Organic Farm. Starting on Saturday morning, all three of the varsity teams in action at home against Wesleyan were victorious: women’s soccer, men’s soccer, and field hockey. There was an information session led by Professor Jeff Cason, the dean of international programs, for the parents of students planning to study abroad, and open houses at both of the College’s entries in the U.S. Department of Energy’s Solar Decathlon, which are now student residences on campus. A gathering of around 80 people laughed along with Mike Bender ’97 on Saturday afternoon in Wilson Hall as he talked about how his website, AwkwardFamilyPhotos.com, and his subsequent books came into being. Bender showed images from his collection and fielded questions on everything from the legalities of using the photos to whether he subjects his own children to awkward poses for family shots. An accompanying exhibit in McCullough’s Center Gallery had people chuckling and reminiscing about their own awkward family photos. An estimated 500 family members trekked to the Snow Bowl on Saturday afternoon, not for a day of skiing, but for a cookout staffed by the student members of the Ski Patrol and for lift rides to the summit of Worth Mountain. Peter Mackey ’74, the director of the Snow Bowl, reported that the views of the Route 100 valley to the east were sensational, and that family members riding the lift spotted the Bowl’s resident flock of turkeys. Families gathered in Mead Chapel on Saturday evening to hear Mary Robinson, the former president (1990–1997) of the Republic of Ireland, deliver an impassioned speech about how climate change has already disrupted the lives of billions of planet Earth’s inhabitants, and how it must be reversed for future generations. Now an advocate for climate justice, Robinson said she was proud to speak at Middlebury for two reasons: because the Student Government Association at Middlebury had invited her, and because the College is the birthplace of 350.org, the international effort to decrease carbon dioxide concentration in the atmosphere. Later on Saturday night the emphasis was on music with an a cappella jamboree in Wilson Hall, an American roots combo at 51 Main, and a Department of Music showcase including the College Orchestra, College Choir, and student soloists at the MCFA. Sunday morning as family members prepared to go home, breakfast venues on campus and in town were packed with people, including some who stopped at Mead Chapel for an ecumenical Christian service, and others who went to the Jewish Center for Hillel’s bagel brunch. Thanks to everyone who made the weekend so successful and informative. I have a much better feel for what Middlebury is all about. I have no doubt that my daughter will receive an excellent education. I was impressed with how polite, respectful and motivated all the students were.